“Heart Listening” is my intention and core idea. My “heart of hearts” focus is on “soul activism” as a first step to “social activism” which stems from each individual heart of a human who has an intention to change the world. Random acts of kindness as focused steps to assist others to rise to meet their “soul goals” would be part of the goal of my work. I am also interested in pursuing work that shares the surging energy of the divine feminine and all that could mean in the changes that are to come in the world. I believe we change from the inside out. I believe in building ladders for the purpose of raising each individual step we take for the best and highest good for all. Listen to our small still voice within to make a stand for other human voices in every corner on our beloved planet. WE are not separate. WE are all ONE. Topic Expert– Brecia Kralovic-Logan is a professional fiber artist, and advocate for creativity and women. She has taught art workshops over the last 30 years in schools, museums, colleges, for art organizations and at regional, national and international conferences. Her art work has been exhibited widely throughout the United States and can be found in the collections of museums and private collectors. 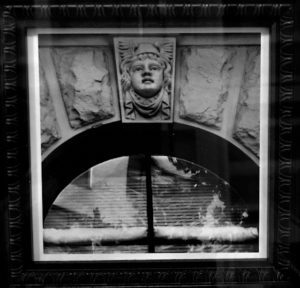 Biography Anne Kleinhenz is a photographer and mixed media artist currently working out of her studio home at the A-Mill Artist Lofts in Minneapolis, Minnesota. Anne received a Bachelor of Fine Arts with Summa Honors in Photography, in the College of Liberal Arts at the University of Minnesota, Minneapolis campus. She is a past recipient of a Jerome Foundation Travel and Study Grant to Tirana, Albania, where she was part of an exhibit at the National Gallery in Tirana. She took a sabbatical from her full-time career in the Advertising industry, and while a single parent, to participate in an Art in Greece study and travel abroad program through the University of Minnesota. 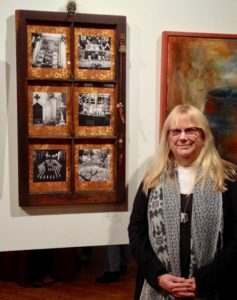 There she fell in love with icons, and her passion for spiritual art was resurrected. Anne’s art has been exhibited in galleries and museums in Minnesota, Washington, Alaska, Greece and Albania. Her work was included in a juried competition at the Katherine Nash Gallery during her studies at the University of Minnesota, and one of her pieces was awarded first place in the annual recognition program and was selected to be included in the permanent collection at the Weisman Art Museum. In addition, her work is included in private collections in Minneapolis, Seattle, Chicago and Anchorage. Anne participated as a Protégé with mentor Jill Waterhouse in the 2013-2014 cycle of the WARM (Women’s Art Resources of Minnesota) Mentor Program, which culminated in a group exhibition at the Grain Belt Brewery gallery in Minneapolis. Artist Statement: Photography is the foundation and conceptual groundwork from which I create visual memories anchored in personal and universal narratives. 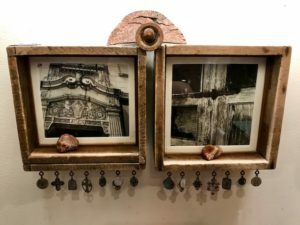 Images are the nucleus for commemorative visual stories that meld and honor power filled spiritual icons and vintage everyday repurposed objects. 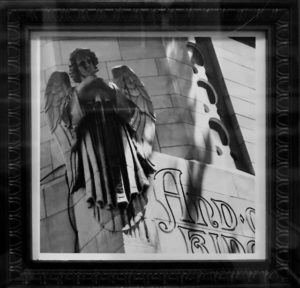 My art is a mixture of photography and archaeology. The remnants of nature and the relics of humanity are fundamental elements. Travel pilgrimages and ancestral origins beckon me to investigate the mysteries of the interconnectedness of all forms of energy and light. It is soul activism that captures my passion through my art. Forward into light. How to find light in a dark place.“Peace in the world depends on peace within…external disarmament depends on inner disarmament.” Art is a source of light. May peace, the spirit of compassion, dialogue and. mutual respect reign within all human hearts.